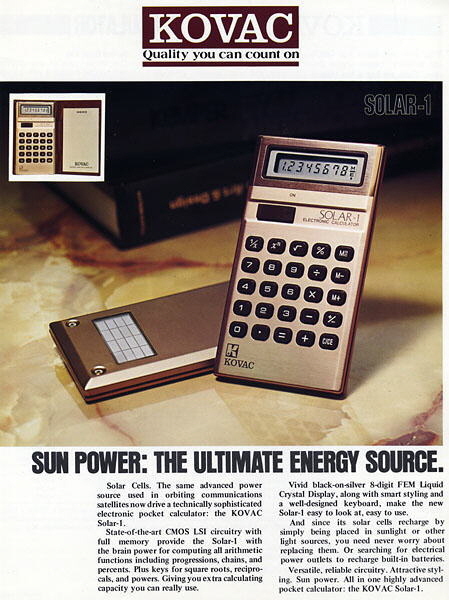 The Sharp EL-8026 "Sun Man" and the Royal Solar I / Triumph-Adler 1980 were among the first calculators equipped with solar cells, though both used the solar cells for recharging internal batteries rather than using power directly from the solar cells. The Kovac Solar I also appears to belong to this class but few details are available about this model. Distinctive features: One of the first calculators to employ solar cells, though unusually these are mounted on the rear and are used to recharge the batteries. Display is 8 digits, LCD (it does not have the intense yellow filter to remove ultra-violet rays which might damage the liquid crystal, but does have a very feint yellow tinge). Power supply is a rechargeable pack made of 3 button cells giving 3.6V. The advertising flyer for the calculators gives a power consumption of 0.0007W. Integrated circuit is a Sharp LI3001, here date coded 1976. Size 66 x 110 x 10 mm (2.6 x 4.3 x 0.4"). Made in Japan by Sharp Corporation. 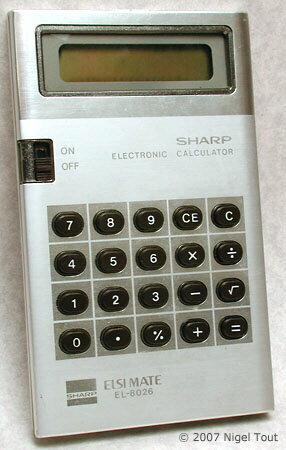 The Sharp EL-8026 was one of a series of Sharp calculators of similar general appearance and using the same rechargeable button cell pack. The other models employ AC-powered chargers, but this model has no provision for a charger, instead using the solar cells to recharge the batteries by leaving the calculator in strong light such as sunlight. In 1976 Sharp had developed the more efficient mono-crystal S-225 silicon Photo-Voltaic module, with cell conversion-efficiency of 10.0%. 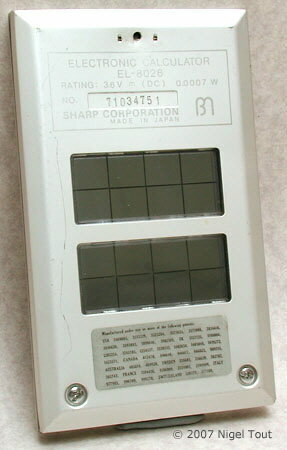 Solar cells of the S-255 type were installed in the EL-8026 calculator, Seiko's "Quartz" watch, and Citizen's "Solar Cell" watch, which became the world's first solar powered consumer products. Since the solar cells are on the rear, this model was not designed to be used while solar powered. The solar cells are only for recharging the batteries. 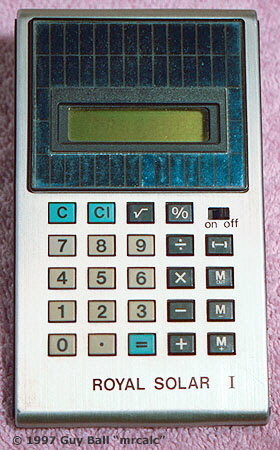 Pure solar powered calculators (with no batteries) appeared a little later with calculators such as the Teal Photon. The journal Electronics Today International Canada stated "The solar cells can be used for 50 hours continuously without receiving any light. Recharging time is 10 minutes under direct sunlight". 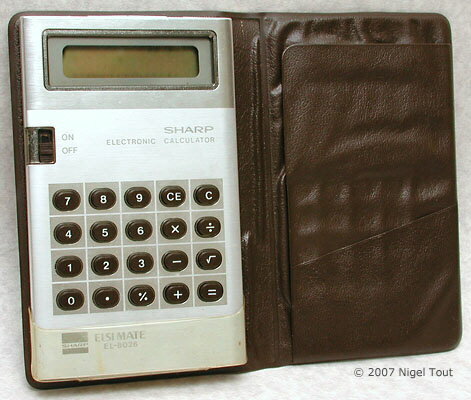 Although Sharp were pioneers in putting solar cells in calculators, they do not appear to have produced a purely solar-cell powered calculator until the EL-825 and EL-826 of 1980. 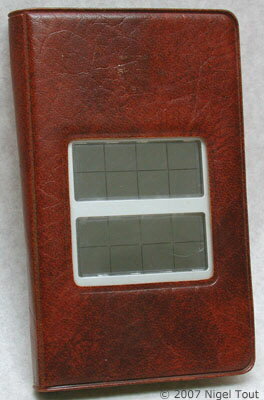 The calculator comes with a wallet, similar to other models in the series, but this wallet has a cut-out in the rear to allow light to reach the solar cells for recharging the batteries. 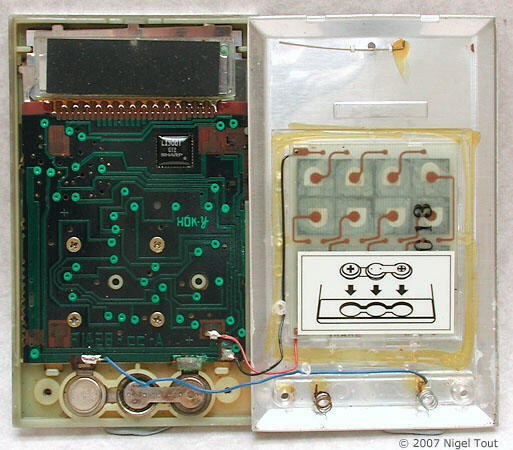 Opening the calculator casing reveals the rechargeable battery pack made of three button cells (at the bottom on the left), which the solar cells (on the right) charge. The LI3001 calculator integrated circuit is mounted in a cut-out in the circuit board. 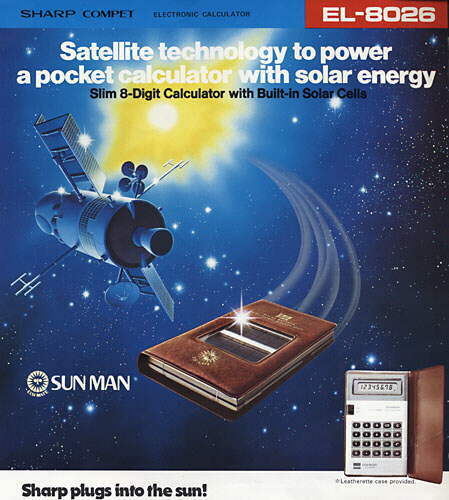 Sharp advertising flyer for the EL-8026 "Sun Man". Distinctive features: One of the first calculators to employ solar cells, though these are used to recharge the batteries. Display is 8 digits, yellow LCD (i.e. with yellow filter to prevent damaging ultra-violet rays reaching the liquid crystal). 4-function, %, square root, memory. Size 81 x 132 x 13 mm (3.2 x 5.2 x 0.5"). The Triumph-Adler 1980 is similar to the Royal Solar I, illustrated above. Both Triumph-Adler and Royal were subsidiaries of Litton Industries. Distinctive features: Could be one of the first calculators to employ solar cells, though unusually these are mounted on the rear and are used to recharge the batteries. Power supply is a rechargeable pack , which is recharged using the solar cells. These models were not quite the first truly "solar powered" calculators since all of them are actually powered by batteries and the solar cells are used to recharge the batteries. For more information on the first solar powered calculators see the page on the TEAL PHOTON. IEEE Global History Network, "Milestones:Commercialization and Industrialization of Photovoltaic Cells, 1959-83". "News Digest - Who needs nicads", Electronics Today International Canada, March 1977, p6. Ball, Guy & Flamm, Bruce, 1997, "The Complete Collector's Guide to Pocket Calculators", Wilson/Barnett Publishing, Tustin, USA.